Since September, 13 dead California sea lions have been reported, with six confirmed to have been shot, according to Seal Sitters, a volunteer group that responds to reports of stranded or dead marine mammals. 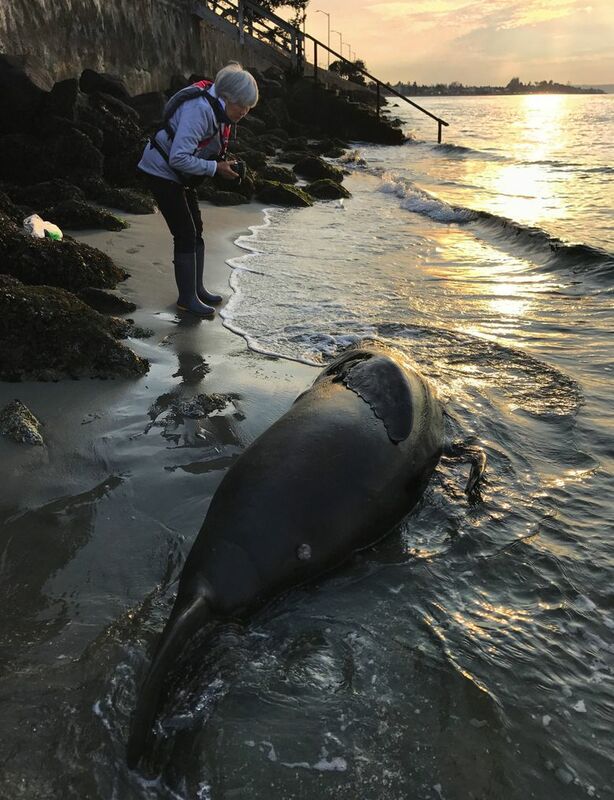 On the afternoon of Nov. 14, Randie Stone came across the bullet-pierced carcass of a California sea lion that washed up along the beach. In 38 years of living by the West Seattle shore, Stone has thrilled to the sights and sounds of these marine mammals, and she was saddened and angered by this encounter. These two carcasses are part of a larger body count of California sea lions slain by humans this fall in Puget Sound. Since September, six sea lions have been confirmed to have died from gunshot wounds in central Puget Sound and Kitsap County, according to Seal Sitters Marine Mammal Stranding Network, a group that responds to reports of stranded or dead sea lions. Another seven are suspected to have died from “acute trauma” caused by humans, including a decomposed sea lion with its head sliced off found washed ashore Tuesday in a West Seattle cove. Michael Milstein, a NOAA Fisheries spokesman, said the federal agency has confirmed the deaths of five California sea lions in West Seattle, including four that died of gunshot wounds. NOAA Fisheries law-enforcement agents are investigating these crimes, which are prohibited under the Marine Mammal Protection Act and can result in fines of up to $28,520 along with up to one year of imprisonment. Many sea-lion killings go unsolved. Anyone with information about a violation of the federal act is asked to call 800-853-1964. California sea lions were once hunted for pet food and pelts almost to extinction, but their population has undergone a remarkable recovery, increasing from less than 90,000 in 1975 to more than 250,000 in 2014. As their numbers have expanded, so too have their conflicts with humans, including some fishermen angry that sea lions may go after the salmon hooked on their lines. Between 1998 and 2017, National Geographic, citing NOAA Fisheries, reported that up to 700 California sea lions were found with gunshot and stab wounds across their range which includes the waters off California, Oregon and Washington. Sea-lion shootings have periodically been reported in Puget Sound during the fall and spring when males migrate from Southern California Channel Islands, where there are rookeries, to forage further north for food, according to Kristin Wilkinson, of NOAA Fisheries. Robin Lindsey of Seal Sitters said reports of shootings typically increase along with the fish runs. 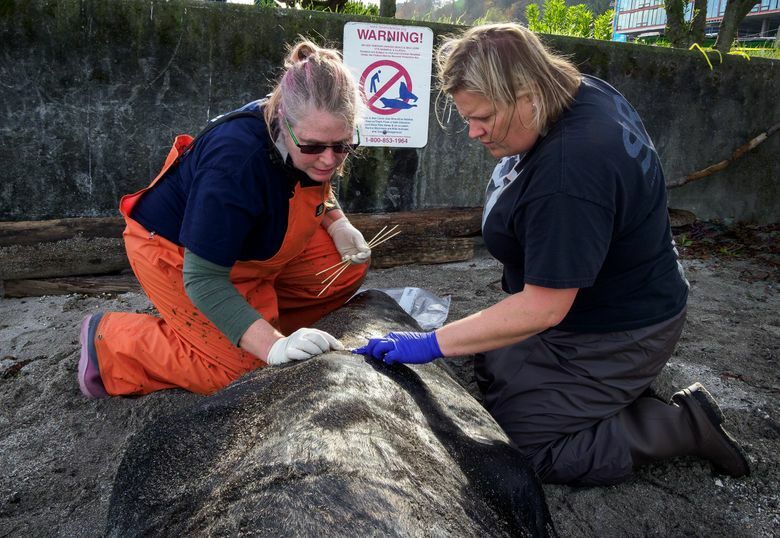 During the nearly three months since September, the number of confirmed sea lion deaths is much higher than an average year during the past decade in King and Kitsap counties. “According to those who live and work along the Elliott Bay and Duwamish waterfront, shots are being heard even more frequently this year,” Lindsey wrote in a Nov. 21 posting on Seal Sitters’ Blubberblog. And the peak period for reports of sea lion deaths is still ahead in the months of December, January and February, according to Lindsey. Seal Sitters is a volunteer group that averages about 200 responses to marine-mammal sightings in the West Seattle area, with the vast majority resulting from harbor-seal pups that pull up on to beaches. The group has been part of a cooperative response to sea-lion deaths this fall with state and federal agencies. The Seal Sitters on Nov. 15 provided photo documentation and other information about two West Seattle sea-lion carcasses. NOAA Fisheries officials involved in orca research towed one of the dead sea lions to shore and Washington Department of Fish and Wildlife biologists examined the bullet wounds. Though federal law provides protection for the California sea lions, their appetite for steelhead and salmon has resulted in NOAA Fisheries authorization for some targeted actions. In the 1990s, several sea lions that repeatedly fed on steelhead trout by the Ballard Locks were relocated. During the past decade, Washington and Oregon state biologists — under a federal permit — have euthanized some sea lions that have been drawn to Columbia River waters below the Bonneville Dam to hunt for salmon. In November, NOAA Fisheries also authorized the Oregon Department of Fish and Wildlife to euthanize some sea lions that have been eating salmon and steelhead south of Portland near Willamette Falls. Though the Marine Mammal Act prohibits the harassment of the sea lions, NOAA Fisheries is developing formal guidelines and regulation for fishermen and others who might seek to deter California sea lions without harming them. In the meantime, the agency has released a list of potential methods, yet to be approved by NOAA Fisheries, but are examples of methods that have been effective in the past. For fishermen, those tactics include pounding on a hull, horns, bells and whistles, underwater firecrackers and rubber bullets. For property owners, they include using fencing or netting to keep out sea lions.